Dominique and I have been going to wineries all over the world. I've dragged the indefatiguable woman everywhere. The other day was one of those moments where we looked at each other, and remembered why we have such fun doing this. We went to a small little winery named Turdo Vineyards. There we met Sal Turdo, his elegant wife Sara, and their lovavble dogs Bella and Bianca. They are a small little place outside Cape May. 5 acres, 6,000 vines, a nice house and a small barn. But there are nothing small about their wines. Some of their wines are only in their second vintage. Oh, my!!! Where do we begin? The Chardonnay (we bought two bottles) and the Pinot Grigio were both excellent. We really loved the Pinor Grigio. They would be stellar anywhere else. But in this list, their memory easilly fades with the other wines to taste. In one tasting, I can tell you one thing, Turis wines (the label you see when you buy the wines), easilly become one of the premiere red winemakers in the state. The Nostrano, a red blend, is fantastic. Bright cherries up front. Darker fruit come through in waves. It's incredible! Easilly a top two or three red in the state. Maybe number 1. The Syrah and the Merlot were also excellent!!! And the Cabernet Suavignon was outstanding. We bought two syrah, two merlot, and two Nostrano. But here's the real surprise. Sal and Sara don't have any semi-dry or semi-sweet wines in their line. Everythign is dry and elegant....save one. Turis Moscato immediately becomes one of the two or three best dessert wines in the state. An elegant, deep honey colored white dessert wine, Moscato is honey, apricots, orangeblossoms, and fabulous acidity. Sal pressures his grapes, culling bad bunches, constantly fussing with his vines, and planting them as closely s possible. He would rather do small volumes of wine and make good wine, than increase his numbers by volume. Dominique and I went to the Christmas Candlelight Tour of Cape May, New Jersey. We then went to Freda's where Dominique had mouthwatering ribs and I had filet mignon au poivre. Each sip of the Nostrano was like a charm. The more we let it beathe, the better is got. After touring the many large, elegant, Victorian manisons on the holiday house tour o a cold, December night, it was incredible to snuggle into a small table with my wife, and sip these elegant wines. Go, see Sara, Sal and the dogs. You will be thrilled. Dominique and I promise. And say hello to Bella and Bianca. Recently, my wife and I went to Cape May. For years, the elusive Cape May Winery was only available at a small number of restaurants. The winemaker and his family were not inetrested in selling their wines themselves, because the wines sold out through local eateries before they could figure out how to sell them from a barn or tastingroom. Times have changed. They now do more than 4,500 cases per year and they have a new tastinging room and winemaking facility. It's an awe inspiring story of how a small, backyard winemaker became one of the biggest attractions of the region. Of course, their most famous wine is their blush, which is very popular with the tourists who want a nice summer sipper during their visit to this very attractive region, and it also mkes a great souvenier to take home with you. However, a funnything happened on the way to the beach. Cape May Winery started making some relly nice wines. We really liked their Chardonnay Reserve. While many reserved oaks reek of too much oak and are relatively sweet. Cape May Chardonnay Reserve is a light chardonnay, with just a nice touch of oak, a light creamy mouthfeel, and a nice clean finish. One of the nicest reserve chards you'll find. We bought two bottles. We then tasted the Merlot 2003 was easilly the wine I liked best. Bright cherry, with a slight hint of vanilla, and some small amount of pepper at the end. A nice dry finish. Excellent. They are now making port, and their newest edition of their port is easilly one of the best ports in the state. The other would be the one from Unionville. Now here's the fun part. For those of you who don't know, the same winemaker made both ports. Darren Hesington left the wonderful, warm environs of Unionville, and has banded together with Toby Craig, of Washington Inn fame, and the two are pushing Cape May to a whole new level. The new tasting room is fabulous and the wines are getting better and better. If you are going down to Cape May, the Cape May Winery's offerings are served in most of the local area restaurants. And now, with the advent of the new facilities, you can have a lot of fun at th winery itself. It's beautiful, and a great spot for parties, bridal showers, and/or weddings. 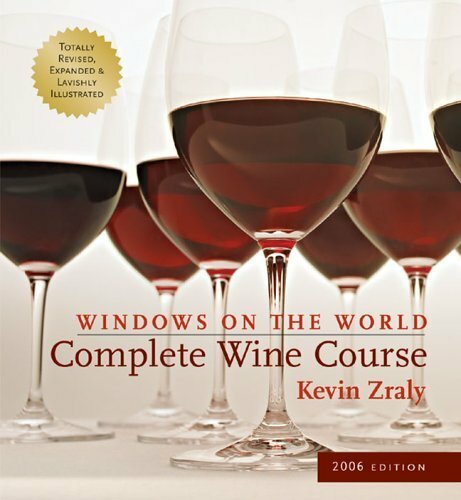 It doesn't take a genius to figure out that Kevin Zraly's Windows On The World Complete Wine Course is an excellent book. It's been an excellent book for 20 years, and has sold hundreds of thousands of copies. But what you should know, if you haven't seen it, is that his newest revision of his classic book, has been completely revamped. It's awesome!!! It's completely re-done. New format, new photography, newly revised. It's an exceptional book, with incredible insights into understanding wine. Even if you already own one of he older editions, go and get this new edition, and let Kevin Zraly lead you back into the world of wine, with all new information. It's an excellent wine adventure, and one well worth undertaking again. James Molesworth wrote about Standing Stone's Vidal Ice Wine 2004, "...tangy...apricot, peach, pineapple...moutherwatering...." In the November 30, 2005 issue of Wine Spectator. This is an excellent wine and a steal at $25.00 per bottle, especially with a score at 90 points. At that price, you should horde it! Also, their Chardonnay Reserve 2003 scored an 88. Congrats to the folks at Standing Stone! Sheldrake Point Riesling Finger Lakes Ice Wine 2004 scored 91 points in the November 30, 2005 edition of Wine Spectator. James Molesworth opined, "Elegant...peach, dried pineapple, and orange blossom notes." This is one of the most expensive Ice Wines made in the U.S., but is still a mere pittance compared to what is being charged by comparable wines from our Canadian neightbors. According to the winery: "Harvested in January from vine-frozen grapes, this fine dessert wine expresses subtle aromas and silky, full flavors of baked apples and peaches; all supported by a mouth-watering acidity and a racy, sweet finish." 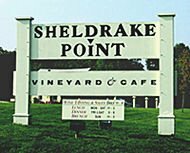 The other nice news it that the Sheldrake Point Riesling Finger Lakes Dry 2004 scored a respectable 86 points. Congrats to the folks at Sheldrake Point!